The Broilmaster P3-sxn gas grill is one of the best on the market thanks to its solid construction and long lasting durability. That’s why this grill comes with the legendary and generous Broilmaster grill warranty. Broilmaster is one of the few companies that can offer long warranties on its products because they still use the same manufacturing methods and Broilmaster grill parts are of the highest quality. Most other companies on the market have abandoned the use of cast aluminum in favor of cheaper materials, while Broilmaster grills are simple in their design but extremely resilient. Read our broilmaster P3-sxn grill reviews further to know more about the great features offered to the users with this grill. Their latest model certainly delivers on the Broilmaster promise, as it features solid heavy-duty construction and one-of-a-kind shutter system. The latter is a lever that enables you to quickly and easily switch to indirect grilling so that you can cook a versatile range of dishes. Temperature control is a breeze thanks to the trio of settings that are available for your cooking grates, which are made from stainless steel rod by the way. This Broilmaster premium gas grill is everything you want and need in a grill. It’s well-made using tough materials like cast aluminum and 304 stainless steel. It may not be much to look at but this is the kind of grill that you’ll be able to pass on to your kids one day. Because it’s durable and long lasting, Broilmaster has backed it with a lifetime warranty. It also doesn’t have a lot of modern features but it offers reliable, even heat distribution and gives you an edge with its multi-level cooking grates and shutter system. It’s worth noting here that the Broilmaster gas grill has a unique cooking system which some people may not be familiar with. The stainless steel shutters are flanked by the cooking grates and the dual control burner. 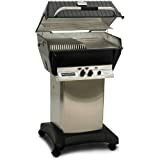 This model offers direct grilling through high heat, while indirect grilling can be switched on by closing the shutter with a dedicated lever. Doing this effectively turns the grill into an oven, whereas putting wood chips transforms it into a smoker oven. We must commend the company on the grill’s varied temperature control which allows you to smoke or sear meat with very little effort. Cooking grates don’t get better than this, as they’re made with heavy-duty cast stainless steel and offer guaranteed durability and unparalleled heat retention. Because it works based on a multi-level system, the grates can be placed up or down depending on whether you want to slow cook your food or grill it at a high temperature. This level of versatility is rare when it comes to modern-day gills so you’ll do well to keep this in mind if you’re still on the fence. We’ll be the first to admit that this grill doesn’t come cheap, especially when you consider the basic design. The good news is that you can get a customized version of it and enjoy the features you like along with the timeless durability of the Broilmaster grill. The process of designing a custom Broilmaster grill usually starts with the grill head, followed by your choice of mounting and lastly your preferred features. A lot of people make the mistake of overlooking this grill because of its simple design. However, it’s one of the very best on the market and is a preferred option among professionals and avid grill lovers alike. Read our guide, If you in doubt which gas or electric smoker better? The type of grill that you end up with is largely determined by the kind of cuisine that you plan to cook. It’s advisable to get a grill with a high temperature-range score if you want to cook a variety of different meats from burgers and bacon to fish and steaks. If ribs are your favorite then you’ll do well to get a grill that does well with indirect cooking. That’s because the indirect cooking function makes it easy to roast or slow cook large cuts of meat. The key is to place the meat next to the fire and close the lid for maximum heat retention. To find out how much heat your grill can handle, check the BTU rating, which stands for British thermal units per hour. However, you shouldn’t just rely on the BTU score, but look out for how well it fares in a preheating test. That will tell you how fast the grill heats up and how well it cooks overall. Burners are the most disposable part of a gas grill and typically last for about 5 to 10 years if they’re well made. Although they’re easy to replace, you should still make sure that your grill is backed by a 10-year warranty on the burners. Infrared is one of those flashy features that are meant to attract customers but have very little substance. It has no bearing on how well the grill works with sear steaks and it functions just like a normal gas burner. If high searing temperatures are an important feature to you, then check online for your grill’s temperature range score. Quality construction is one of the most important characteristics of a well-made grill and one of the first features you should look for. To make sure that the grill you’re buying is sturdy, try jostling it from different angles and check individuals parts like the firebox, lid, wheels, and cart for durability. It’s important that the cart is made from sturdy materials like stainless steel and make sure that it has welded joints instead of nuts and bolts. Check the number of wheels on the grill as well. It should have at least four wheels so that it’s easier for you to move it around. And make sure that the wheels have a full axle as this is a sign of proper construction and they’re more likely to last longer. You must be wondering why we’re stressing grill stability so much on this buying guide. This is because a stable grill is safer to work with and will not let you down after a few seasons of regular use. The handle shouldn’t be located close to the lid as it might burn your fingers when it gets got. There should be no sharp edges and corners on your grill either because these might be a safety hazard. Make sure that there’s a considerable distance between the flavorizer bars/ burners and the grates in order to avoid dangerous flare-ups. Natural gas is a popular option because it’s affordable but a gas line has to be installed at your house in order to use it. Propane grills are more convenient because they’re portable and their power source is easy to find. It’s possible to convert a grill from natural gas to propane using a conversion kit but these have to be purchased separately. Grill prices generally start from $150 and can go up to thousands of dollars. As with anything, the higher the quality the more expensive the grill. However, you need to consider your budget as well and start your search based on a comfortable price range. While there are plenty of gas grills in each price category, the most value for money can be found under $500 gas grill. Be sure to look out for special deals as well, like models that come with extras like a free propane tank. The BTU rating of a gas grill is another important consideration to make because it’s an indication of the heat output. BTU is sometimes determined by the size of the grill. Smaller grills tend to have a lower BTU rating than lager models, which can contribute to longer cooking time and will make it difficult to sear steaks. You may not see this in most Broilmaster grill reviews, but it’s important to teach yourself the basics of grill maintenance in order to extend its lifespan. You need to learn how to clean and store it appropriately to avoid the build-up of residue and maintain performance. For instance, some grills must be cleaned while they’re still hot in order to avoid any damage. The only exception to this rule is porcelain, which you must allow to cool off so you can avoid chipping.